Previously, I’ve focused on the rising Latino vote but Donald Trump has major problems with another demographic: Jewish voters. Jews also tend to punch above their weight due to high voter turnout. For example, according to the American Jewish Population Project, Jews form 3.4% of adults in Florida. But the exit poll indicates that Jews formed 5% of the Florida electorate in 2012. The Jewish population skews older and educated–both strong predictors of voter turnout. Regrettably, this is one of those areas where there is so much to say and so little time. Trump has a very consistent track record of invoking anti-Semitic tropes. A Star of David over a pile of money is not exactly the last word in subtle. Trump later claimed that it is a “sheriff’s star” except that Trump wants us to believe that he was comparing Clinton to . . . a sheriff? Like so many Trump explanations, it fails the “don’t pee on my leg and tell me it’s raining” test. Then, of course, there is the little problem that the tweet was directly copied from a white supremacist website. Which is where, of course, all campaigns source their material. Black guys counting my money! I hate it. The only kind of people I want counting my money are short guys that wear yarmulkes every day. Those are the kind of people I want counting my money. No one else. He denigrated Jews and Blacks together, so this one was a twofer. Way to go, Donald! Nationally, Jews are far more Democratic and liberal than the electorate at large. According to a detailed Pew survey, 70% of Jews are Democrats or lean Democratic compared to just 22% who are Republican or lean Republican. While 49% of Jews say they’re liberal, just 19% claim to be conservative. Trump’s nativist populism seems designed to turn off liberal Jews. The only subgroup of the Jewish population that is more conservative than liberal are Orthodox Jews (54-12). Ultra-Orthodox Jews being especially conservative (64-7) compared to Modern Orthodox Jews (41-22). However, only 10% of American Jews are Orthodox and only 6% are Ultra Orthodox. But Trump is putting in maximum effort to alienate them through his statements on Israel. As regards to the Israeli-Palestinian debate, Trump said “Let me be sort of a neutral guy” in response to a question about whose fault it is that the conflict has continued. Equally tellingly, when he discusses the conflict, he sees it entirely from the perspective of making a deal and doesn’t mention Israeli security. While American Jews overall favor a two-state solution for Israel by 61-33, Orthodox Jewish opinion is 30-61. So Trump’s proclaimed neutrality and eagerness to make a deal goes against the grain of conservative Jewish public opinion. In contrast, as a senator from New York, Hillary Clinton developed a reputation as a steadfast supporter of Israel. He espouses things that are offensive to my Jewish sensibilities and values, like precluding an entire religious group from entering the country, like demeaning women, like demeaning minorities, like demeaning ethnic groups, like demeaning the disabled, like belittling war veterans. . . . So I just find him to be an offensive individual. … He knows nothing about foreign policy, but that hasn’t stopped him from talking about it. His most rabid supporters enjoy photoshopping Jewish reporters into concentration camp scenes and ranting about Jewish control of the media and the banks. . . . Trump’s energized the anti-Semites and he shows no interest in disabusing them of the idea that he’s their man. … Until and unless he does, he probably underperforms with the Jews. No wonder the ADL expresses concern about the guy. 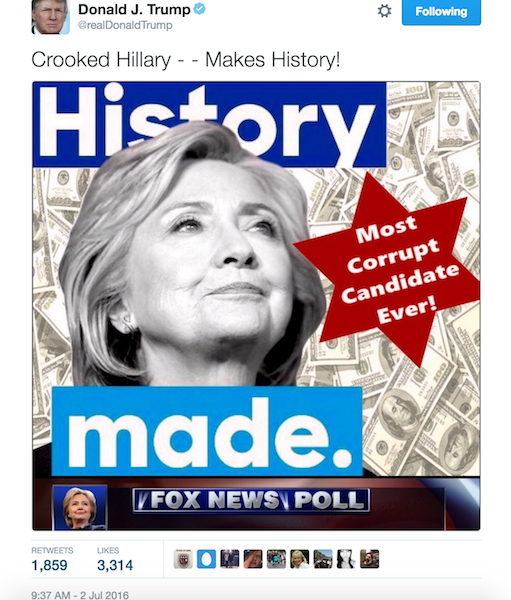 Surveys done earlier in the 2016 campaign–before the infamous Jewish Star tweet–already indicated that Jews “overwhelmingly view of Donald Trump negatively” and lower levels of Jewish support for Donald Trump than Mitt Romney. Expect Hillary to run up the Jewish vote in swing states. Over the past two weeks, we’ve seen how Republicans fear and loathe America’s diverse future, while Democrats embrace it. Four years ago, the Republicans issued a report arguing that they needed to make their peace with immigrants or continue riding the waves to political oblivion. Bad news for the Republicans: the future is now. 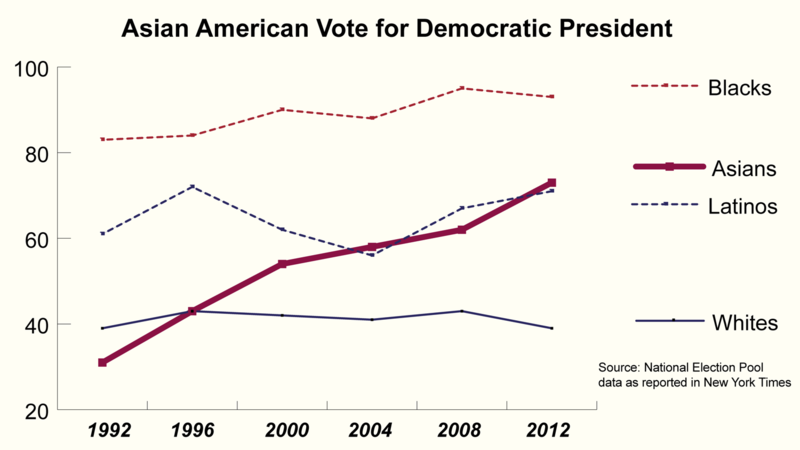 Pew reports that the Latino electorate will by 17% bigger in 2016 than in 2012. In concrete terms, this means that there will be 3.97 million more eligible Latino voters. This exceeds the 3.22 million increase in the much larger white population. 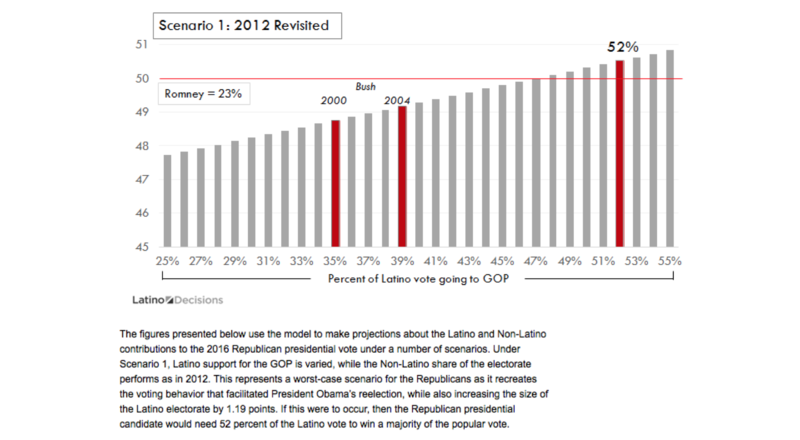 So the Republican political imperative to grab a higher share of the Latino vote only continues to grow. Nearly 180,000 illegal immigrants with criminal records, ordered deported from our country, are tonight roaming free to threaten peaceful citizens. . . .
As it turns out, immigrants commit crimes at lower rates than other Americans. For some reason, undocumented immigrants would rather avoid the authorities. Go figure. These attacks on immigrants are particularly damaging because so many Latinos live in mixed status families. Even Latinos who don’t see these tactics as demonization of them as a group. We’ve seen the political effect of this in the past. For those who don’t remember the days of yore, California voted Republican in every presidential election from 1968 through 1988. Now, it is a safe Democratic state and Republicans don’t even bother. Pete Wilson’s tactics rendered the largest state in the Union a noncompetitive Democratic bastion. 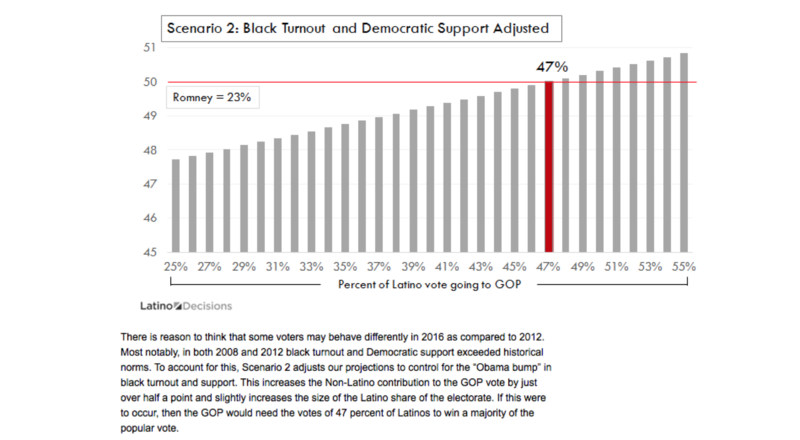 Latino Decisions has helpfully outlined just how bleak the demographics are for Republicans in a series of figures that estimate the share of the Latino vote that Trump would need to win in 2016. 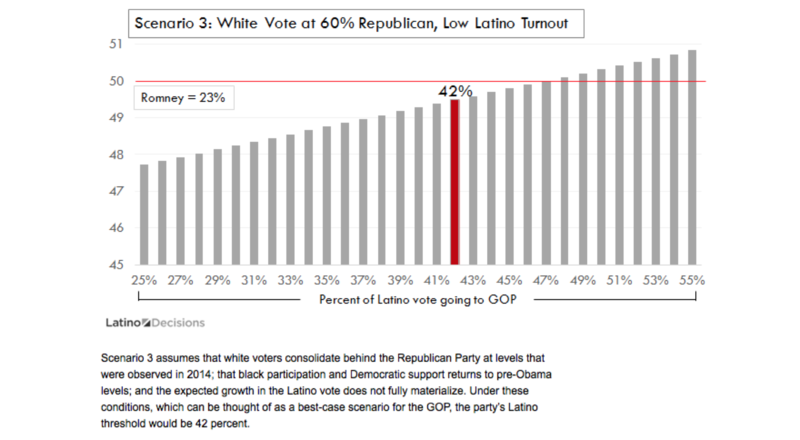 The first shows the worst case for the Republicans, as it assumes that turnout rates among all demographic groups remain unchanged from 2012 and that support rates among non-Latino groups for the Republicans also remain the same. 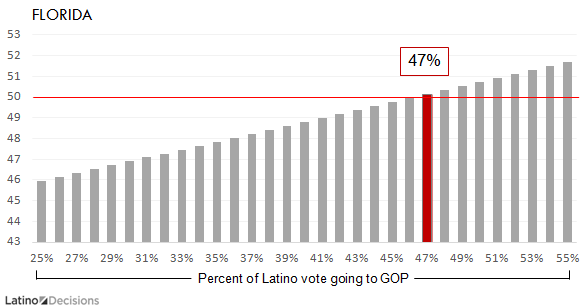 Trump would still need 47% of the Latino vote. Cue laugh track. Even under this optimistic scenario, Republicans still need 42% of the vote. Mitt Romney got just 23%. Anyone wanna bet that Tweety McOrange is going to do better than Mittens? Unlike Asian Americans, so many pixels have already been spilled on the hate-hate relationship between Trump and Latinos. Today’s post attempts to take a deeper dive into why Trump’s total alienation from Latinos dooms his presidential bid in Florida. Florida was long viewed as very safe Republican turf before it morphed into the ultimate swing state in 2000. Long term trends combined with Trump’s anti-Latino vitriol will heave the state more strongly towards Team Blue. Why is this happening? 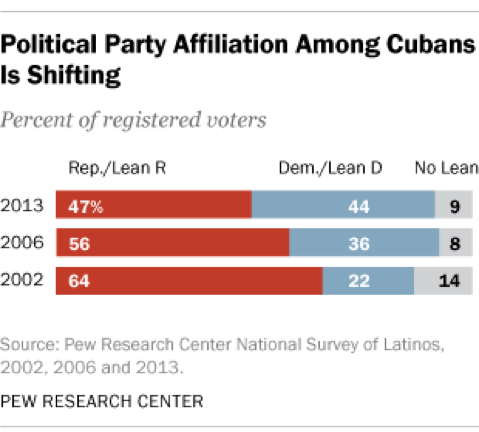 For a start, young Cuban Americans are much more Democratic than their elders. In contrast to those who fled the Castro dictatorship in the 1960s, young people and more recent arrivals take a more nuanced view of relations with Cuba. Two-thirds under age 49 now oppose the American embargo and Obama’s decision to normalize relations with Cuba has net support of +20 among Cuban Americans of all ages. Donald Trump is the catalyst who could force a decisive break between Miami-Dade County’s influential Cuban-American voters and the Republican Party, a new poll has found. Local Cuban Americans dislike Trump so much — and are increasingly so accepting of renewed U.S.-Cuba ties pushed by Democratic President Barack Obama — that Trump’s likely presidential nomination might accentuate the voters’ political shift away from the GOP, according to the survey shared with the Miami Herald and conducted by Dario Moreno, a Coral Gables pollster and a Florida International University associate politics professor. Thirty-seven percent of respondents supported Trump, a number that is still higher than the 31 percent who backed Clinton — but also “the lowest in history that any potential Republican candidate polls among this traditionally loyal demographic,” according to Moreno. By the way, Moreno is the demographic–he’s a Republican Cuban American who won’t vote for Trump. The share of Puerto Ricans has risen rapidly with many settling in the Orlando area. Due to the economic crisis on the island, a stunning 9.1% of its residents have left for the mainland from 2005 to 2015. Florida’s Puerto Rican population now rivals New York’s. Puerto Ricans are American citizens and can vote in presidential elections the moment they move to the mainland. 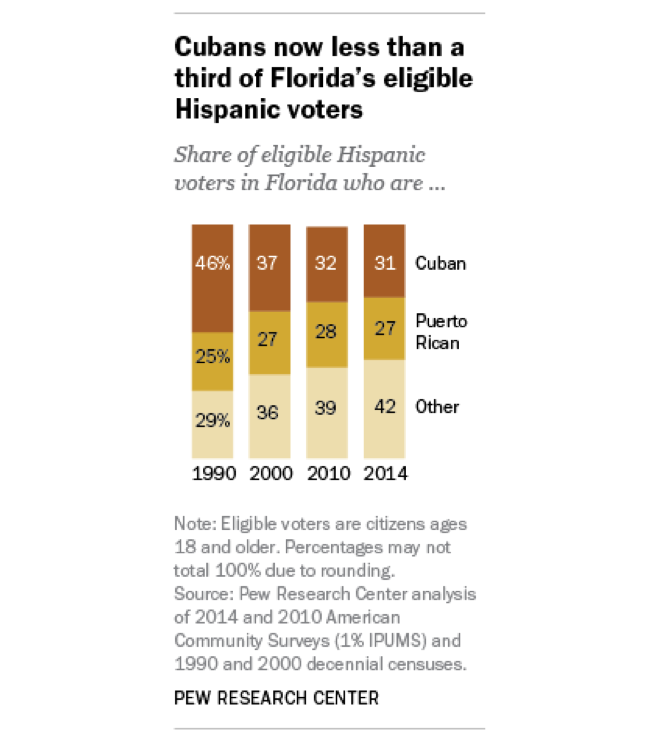 And they are an extremely Democratic constituency, as are the other non-Cuban Latinos in Florida. 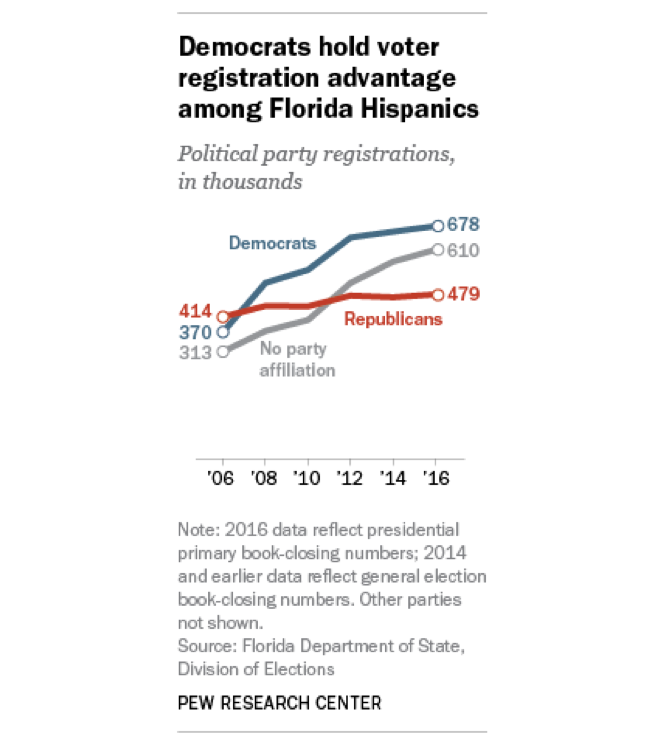 On the whole, Florida Latinos really don’t like Donald Trump. Among the entire group, Latino Decisions reports that 84% have an unfavorable view of the Donald, as compared to just 12% who like the orange guy with the club in Palm Beach. Does anyone think Trump is going to get anywhere near this figure? Even if his share of the white vote rises, strong Latino support gives Clinton a nice cushion. Right now, the world is headed into full panic mode because the four post-Republican Convention polls released today show Trump up by an average of 2.5 points. I can’t say I blame people for panicking. The very idea that Trump could become president is a manifest danger to the country. Democrats are nonetheless well-positioned to win this election based on fundamental trends that Trump shows no sign of defying despite his unconventional campaign of fear and outright lies via Twitter and the free media. Today, I focus on Asian American voters, who receive little media attention despite being a very fast growing part of the electorate and dramatic shifts in their partisan preferences. The other fast-growing portion of the electorate is Latino voters, while the share of whites shrink in each presidential election. It has attracted almost virtually no public notice but Asian Americans have shifted their voting behavior dramatically since 1992. Asian Americans voted strongly Republican 24 years ago but have voted more Democratic in every election since, shifting from roughly 30% to over 70% Democratic. As we now know, these aren’t oopsy-daisies but part of Trump’s longstanding pattern and deliberate campaign choice. Weak support for Trump among college-educated Americans will only reinforce this trend. While education levels vary dramatically among Asian American individuals and by national origin, Pew reported in 2010 that a higher share of Asian Americans were either in college or had received a college degree than for any other racial group. 1. 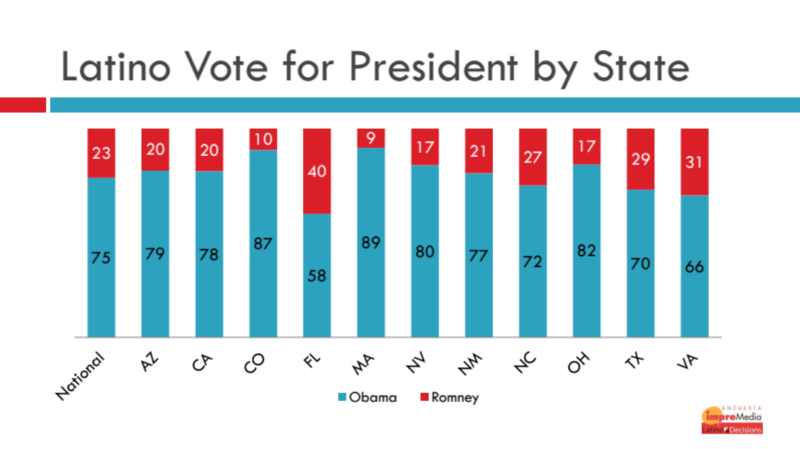 Asian Americans will once again make up a higher share of the electorate than in the last presidential election. Pew reports that the share of Asian American voters will be up by 16% compared to 2012, as compared to just 2% for whites. 2. The unrelenting Republican attacks on immigrants and trade with Asian countries will likely result in record Democratic support, the continuation of a steady trend over the past two decades. Looking to the future, George Will observes that Asian Americans could help turn Texas blue sooner than realized. During his public career, Pence has been an outspoken opponent of equal rights for lesbian, gay, bisexual and transgender citizens. In Congress, he opposed efforts to encourage foreign governments to decriminalize homosexuality and sought to block the repeal of the military’s “don’t ask, don’t tell” policy. As a governor, he stood against not only marriage equality, but civil unions as well. He also opposed a law prohibiting discrimination against LGBT people in the workplace and signed one opening the door to wide-ranging discrimination against these residents of his own state under the guise of religious liberty. On their own, such actions would signal that Pence would work to reverse the progress that has been made and stand in the way of efforts to advance the equal dignity and opportunity of all Americans, efforts which so many other Republicans fully support. But it is his past support for, and failure to repudiate, the heinous practice of conversion, or reparative, “therapy” that raises an even more disturbing concern: Pence doesn’t just seem to disagree with advocates for equal rights on issues of law. His record suggests that he personally believes LGBT people are abnormal and unworthy of the equal protection of the law. For almost nine months before my 30th birthday, I had the relationships that I most valued questioned and my life demeaned by the use of techniques, including shock therapy, with no basis in science or medicine. Indeed, Chrys is typically American is so many ways. Being gay is a normal, integrated part of his life. On an average Facebook day, Chrys is likely to tout his family’s restaurant, his pride in his Greek heritage (My Big Fat Greek Wedding has nothing on Chrys) and what’s going on at work. And yes, he may well mention the guy he loves too. Why any of this is a threat to America escapes a fast growing majority of Americans. Republicans need to listen to this guy if they want any hope of saving their party. From a purely practical political perspective, Pence is way behind the curve. A majority of Americans now support marriage equality. For that matter, a majority of young Republicans support marriage equality. Never mind conversion therapy, the “go ahead an hate your neighbor” agenda just doesn’t work anymore. More importantly, any effort to reconstruct a new positive and moral agenda from the wreckage that is the formerly Grand Old Party will require a focus on freedom. Accepting that government should not legislate against LGBT Americans would be a good start. The first Purple Line associated development project is going up and –surprise–is about development rather than transit-oriented development. At Chevy Chase Lake, EYA is building “62 stately” “luxury elevator townhomes” that start at $1.5 million. All will have two car garages. Why the two car garages if everyone is going to be riding the Purple Line? Unless you think elevators count, that sure doesn’t sound like transit-oriented development, and surely places into question claims that ridership of people who live near Purple Line stations will be unusually high. Despite the claims that the Purple Line would increase affordable housing in Chevy Chase, even as quite a few existing affordable housing units get knocked down, this development is not about that goal either. I suppose one can make the trickle-down development argument that increasing supply will lower the price–not one usually associated with progressives who support the project. But we could have done that without billions on the Purple Line. What is this really about? Thanks to our public subsidy, the owners and developers of the land can build more and make a tidy profit on the roughly $100 million for which they intend to sell the units, which will be valued for their close-in location to DC, proximity to Bethesda and Silver Spring and good school district more than the pricey Purple Line. Accompanied by some shops, I imagine it will be a very nice place to live. Attracting more wealthy taxpayers and raising the value of the land will also increase the County tax base–good for the County and its economic health. The irony, of course, is that in the future many of the same people who supported the Purple Line as a “social justice” measure will use undoubtedly use this development as an example of the growing economic divide in the County even though the policies they supported made this happen. Michael Steele: “Was Expecting and Hoping the Party Would be Having a Different Conversation” with the Country. On the election front, the Free State promises to be virtually news free between now and November. Maryland elects all state and county officials during the midterm election. True, Baltimore City is holding its mayoral and city council elections but I can’t say that the suspense is exactly killing me in this all Democratic town. All quiet on the local front. At the federal level, we have an open U.S. Senate seat where all the drama was in the primary. It is the only open seat rated as “solid Democratic” by the Cook Political Report. No one is waiting with baited breath to see if state Sen. Kathy Szeliga, a Trump supporter, beats out Rep. Chris Van Hollen in a state that FiveThirtyEight says in the second most likely in the nation to vote for Hillary Clinton (polls-only forecast). Maryland will also elect its eight federal representatives. Again, the excitement was in the primary for two open seats. The Fourth Congressional District saw former Lt. Gov. Anthony Brown make his political comeback. In the Eighth, state Sen. Jamie Raskin beat out a record-setting self-funded candidate. But the general election should be a yawner. Charlie Cook rates six districts as “Solid Democratic” and one as “Solid Republican.” Rep. Delaney’s Sixth District gains marginal attention as “Likely Democratic.” It seems unlikely that Delaney will be caught napping twice or that he’ll lose in 2016 — the Sixth lists Democratic in presidential elections — when he didn’t in the Republican banner year of 2014. If contested Virginia did not share the DC media market,. Maryland could be almost free of TV ads in the presidential campaign. Garrett is in the Pittsburgh media market, so it can also expect to share in Pennsylvania’s inundation. Even the General Assembly is out of session and Gov. Larry Hogan is doing his expedient best to do his disappearing act during the presidential campaign. UPDATE: The Cecil Times informs me that Cecil County has a race for county executive this year. Two commissioner seats are also up but unopposed since the Democrats didn’t put up candidates.